Tyson requires a new home as his owner has developed health issues. He is 9 1/2 years old, full of life and is in good health. I if you feel you could give him a place in your home please get in touch. You have read the profile and are interested in rehoming Tyson. What happens next? We will arrange for someone to visit you at your home to carry out a Home Check. This NIBRS representative will sit down with you to complete a “Prospective Rehomers” questionnaire. If the Home Check is successful, an arrangement will be made for you to meet the Boxer or have it brought to your home. If the initial meeting is successful, the Boxer will be signed over to you and you will be asked to make a realistic donation to NIBRS to help us carry on our work and so help future Boxers. Be aware that the only papers we will give to you about the Boxer will be its vaccination papers. There will be no pedigree papers as the Boxer is not to be used for breeding. 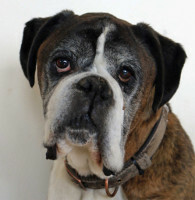 We endeavour to give you as much information as possible about the rescue Boxer, its background, likes, dislikes, diet.